Students who have extreme difficulty determining if a note is higher or lower than another. A person who has a hard time matching their voice to a pitch. A students who are having extreme difficulty with the “Ear Training One Note Complete” method. Parents who want to participate in their child’s ear training. The inability to distinguish whether a pitch is higher or lower. An inability to vocally replicate a note when it is sung or played on an instrument. Inability to hold a pitch for more than a few seconds without straying from it. Extreme difficulty with the “Ear Training One Note” exercises. Although most of the exercises in this course are meant for someone with drastic pitch recognition problems, it can also be a fun, simple game for children to guess which note is higher or lower using the multiple instruments found in this course. At the same time it gives a parent a good indication of their child’s inherent pitch recognition skills. 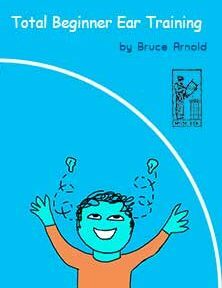 It is an excellent companion for the Children’s Ear Training: Go Tell Aunt Rhody course. Some people think that lacking the skill to determine whether one note is higher or lower than another makes someone tone-deaf. It’s not that simple. Stringed instruments for example, have a stronger 1st harmonic than the fundamental. This can greatly confuse some students and make them incorrectly guess which note is lower or higher. For other students there is great difficulty matching a pitch with their voice. Another issue some student have is an inability to continue to sing on one pitch without “wobbling.”In these two cases there exists a basic disconnect between the ear and the voice. Through some simple exercises you can correct this problem. There are three kinds of MP3s for practicing recognition of which note is higher or lower. Piano, Trumpet and Tenor Sax MP3s are available for a total of 76 audio files. Test yourself here. If you are having difficulty then this course would be a good place for you to start to fix these issues or a good game for your kids! See if they can sing the notes too. That makes it more challenging and fun! The Total Beginner Ear Training course also contains 340 MP3s that can help a student who is struggling with the “Contextual Ear Training” exercise found in the Ear Training One Note Complete Course. But is also useful for a student who has gained the ability to discriminate whether a pitch is higher or lower than another. For them, the next step is to learn how each of the 12 pitches sound in a key center. These exercises play a note, then a chord. The idea is to start to hear what the note sounds like against the chord which is the key center. It is a good idea to also sing this note as the chord plays so that you can hear its unique character within a key center. Because these files repeat for a few minutes, it really helps to ingrain the sound of these pitches in a key center, which will be a crucial skill in other contexts. Improve Your Pitch Recognition with Total Beginner Ear Training! Total Beginner Ear Training has many different kinds of exercises that can be helpful for an adult or child to hone their pitch recognition skills. They can be a fun way to pass the time in a car ride or a game to play with kids. With all of these exercises it’s important to keep a positive attitude. I’ve never had a student with ear training difficulties that couldn’t fix their problem by working on the various exercises found in this course and others which I have authored. I encourage students and parents to stay in touch with me via email to give me updates on progress and I’m also there to answer any questions –or even give a pep talk! 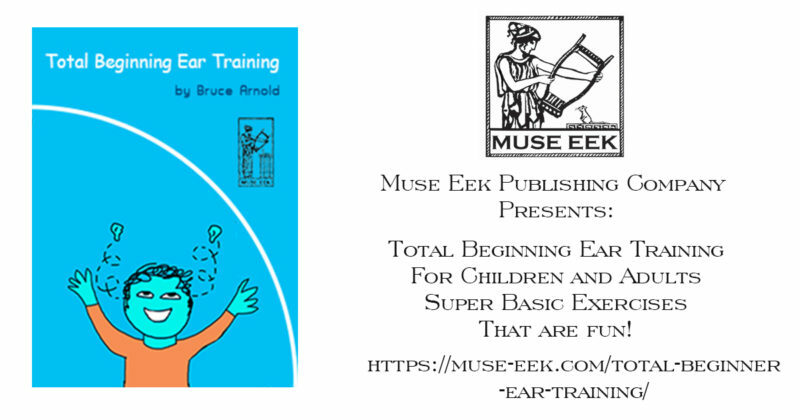 This entry was posted in Ear Training and tagged ear training, total beinning ear, total beginner ear training, total beginner ear, beginner ear training by Bruce Arnold. Bookmark the permalink.